View of “Katharina Marszewski: Unnecessary Warsaw Correspondent,” 2016. Contrary to its title, Katharina Marszewski’s exhibition “Unnecessary Warsaw Correspondent” makes a case for the artist as necessary witness—not only to historic events such as wars but also to everyday life. Born in Warsaw and raised in Düsseldorf, Marszewski attempts to reconcile her memories of the city of her birth with its present state through her ongoing photographic practice. 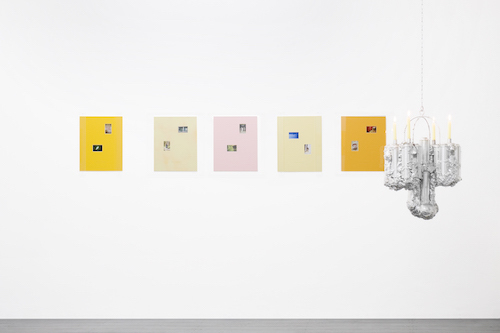 Here, she presents a group of sixteen works from the series “Set of Jaunesse,” 2016, made up of yellow cardboard passe-partouts, each with with two cutouts that frame pairs of seven-by-ten-centimeter photographs, fixed to the wall by a pane of glass. The images, taken over the course of more than a decade, alternate snapshots from public and private life: a dumpster with the words “Clean World” stenciled on its side; an interior staircase; a clamshell-shaped jewelry box. Most but not all of the photographs were taken in Warsaw. Rather than the place itself, this daily record attempts to capture a relationship to it. Each passe-partout has the words “Casino d’Objects” engraved on it, a deliberate misspelling of a French phrase. The title of the series (which is also screen-printed onto a wall of the exhibition) likewise bastardizes French words to convey multiple allusions—jeunesse means “youth” while jaune refers to “yellow”—together suggesting some kind of jaundiced nostalgia. A curious prop is added to the show: Frankfurter Chromleuchter, 2016, a candelabra hanging from the ceiling, covered in waxy lumps, and spray-painted silver. This unlit lamp tilts the show from a recollection of quotidian experiences into something more macabre. The candelabra is actually an appropriated work from another artist, Ricardo Lee Perez, which suggests that memory is borrowed, sometimes even created by objects and images not our own.